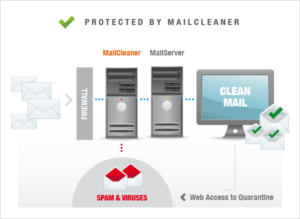 MailCleaner is an enterprise-class Anti-Spam/Anti-Virus solution. It can be very quickly deployed into our customer environments as a lightweight virtual machine, and even clustered to provide a high availability solution. It provides the administrator and end users an easy to manage spam and virus quarantine so that any false positives can be released. GlobalCerts utilizes MailCleaner with our SecureMail Gateway installations to give our enterprise customers one of the best combinations of email security solutions available at an excellent price point. MailCleaner is a business anti spam gateway installed between your mail infrastructure and the Internet. It offers professional protection against viruses and eliminates up to 99% of spam. While email is necessary for any corporate operations, it can also expose your company to a myriad of risks. This is because it offers viruses, spyware and other harmful programs easy access to your business computers. This is where MailCleaner can help by stopping malware before it even reaches your employees’ inboxes. Its spam filter server also ensures that 99% of unwanted messages are blocked, analysing each message so you only receive those that are important. If a harmful file is detected, MailCleaner will automatically send it to a quarantined zone where it cannot cause any more damage in the future.